 Julian Lage & Chris Eldridge – ArtsLIVE! All purchased tickets will be at WILL CALL at the door. includes Artist Talkback Session, heavy hors d’oeuvres, one free drink ticket, cash bar, early admission to regular show with premium seating, and access to Gari Melchers Studio after the concert. Doors open at 5:30pm, talkback session runs from 5:45-6:30pm, show starts at 7:30pm. 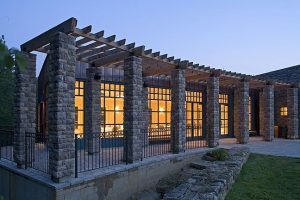 includes light hors d’oeuvres, cash bar, and access to Gari Melchers Studio after the concert. Doors open at 6:30pm and the show starts at 7:30pm. Julian Lage & Chris Eldridge first met backstage in Boston following a Punch Brothers show. Over the course of several years, a casual friendship led to a solid musical partnership that produced the 2013 EP Close to Picture and 2014’s full-length release Avalon, produced by Kenneth Pattengale of The Milk Carton Kids. 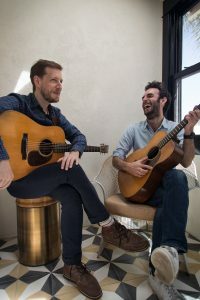 Known for pushing the envelope of folk, bluegrass, and jazz, Lage & Eldridge showcase, as the New Yorker writes, a “familiarity with the fretboard…so extravagant and capacious that they bring flourishes to this music that it simply hasn’t enjoyed before.” Their performance is sure to astound. The Grammy-nominated Lage has been highly regarded in jazz and new music circles for his own work as well as for his collaborations with such artists as Nels Cline, Fred Hersch, and Jim Hall, among many others. A former child prodigy, Lage has been recognized for his remarkable musical ability from a very young age, which was displayed in the acclaimed 1996 Oscar-nominated short documentary, Jules at Eight. Fellow Grammy-nominee Eldridge, an Oberlin Conservatory grad who studied with bluegrass guitar legend Tony Rice, is equally noted in the progressive bluegrass world for his stints with the Seldom Scene and The Infamous Stringdusters, which led to his joining Chris Thile’s adventurous quintet, Punch Brothers.